For further information or to let us customize your Vancouver Island fishing vacation, please submit the form below and we will get back to you right away with a vacation plan that will work for you. Click to send form Click to clear your message and start over. All rates and package prices are quoted in CDN funds and do not include 5% GST, gratuities, transportation, alcoholic beverages or fishing licenses. 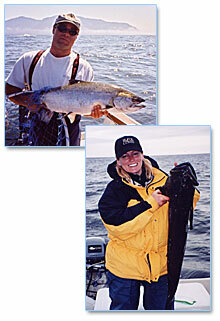 BC Sport Fishing Trips and Adventure Eco Tours Salmon - Trout - Steelhead - Halibut - Fly Fishing Charters - Campbell River & Kyuquot Sound Wildlife Viewing - Whale Watching - First Nations Culture - Guided Boat Tours It's all here waiting for you on Vancouver Island, British Columbia, Canada!